WHO’S READY FOR SOME STORAGE WARS?!?! 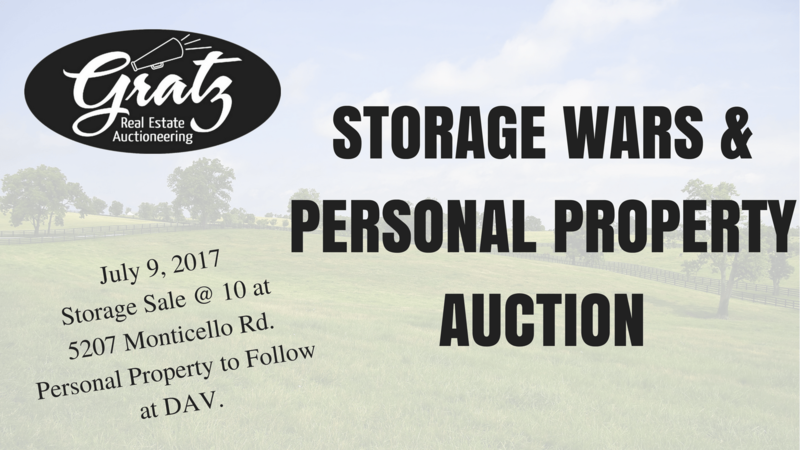 A-OK Storage has been recently purchased and the new owner has 8+ storage units and all contents of those units will be auctioned off at 10:00 am (prior to our auction at the DAV). We will open the doors of each unit at 9:30 am for everyone to take a peak inside. Nobody will be allowed to go inside these units but you will be able to get a glimpse of what’s in each one. Each unit will be auctioned with its full contents!! If you purchase one of these storage units, it will be your responsibility to haul off everything inside. This is a great opportunity to nd some hidden treasures!! Level, Hacksaws, Air tools, Snap-on Air Drill, Dewalt Drills & Saw, Wizzard 1/2’ Drive Sockets, Tool Box, Craftsman Radial Arm Saw, Craftsman Ban Saw, Craftsman 1 hp Belt Sander, Husqvarana 350 Chain Saw, Bushwacker Gas Hedge Trimmer, Craftsman 3 hp 10” Table Saw, Dual Wheel Grinder, Wood Clamps, Bolt Cutters, Log Chains, Dewalt Electric Drill, Black & Decker Hand Sander, Dewalt 4’ Grinder, Sears Router, Craftsman Sander, Craftsman Dubtail Kit, Vermont American Kit, Craftsman Router Guide, Air Paint Sprayer, Dewalt Brad Strapler, Craftsman Sander, Craftsman all-in-one Cutting Tool, Log Chain, Hand Saws, Wheelbarrow, Hand Twist Cultivator, Craftsman Radial Arm Saw 10” (like new), Aluminum Ladder, Antique “Grim Reaper” Mowing Scythe, Car Jacks, & lots of misc. tools.